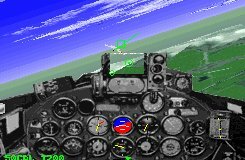 Sabre Fighter Plane Simulator is a freeware sim. That's right... free! No charge. There are versions for Windows 95/98, Linux and Windows NT. The sim has been hard to find from time to time and as of December 2001 doesn't have it's webpage on display. However Dave T. Jones tracked the file down at www.kalkbay.co.za. F-86 Sabre jet bags a MiG.